Lonely Planet 1000 Ultimate Adventures, 1st Ed. 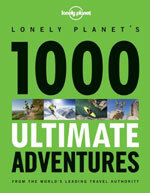 The follow-up to 1000 Ultimate Experiences is Lonely Planet's collection of the world's most exciting adventures. For armchair travellers and adrenaline junkies, 1000 Ultimate Adventures rouses you to explore the world on foot, by bike, motor vehicle or horse. - over 140 beautiful images.